The cultivated variety of these crisply delicate mushrooms comes in clumps of long, spaghetti like stems topped with tiny, snowy white caps. (In contrast, the wild form has orangy-brown, very shiny caps.) Enoki mushrooms have an appealingly crunchy texture and mild—almost fruity—taste, unlike the bosky flavor of most mushrooms. They’re available fresh year-round (depending on the region) in Asian markets and many supermarkets. They can also be purchased canned. Choose fresh mushrooms that are firm and white. Refrigerate, wrapped in paper towel then a plastic bag, up to 5 days. Before using, they should be cut away from the mass at the base of the stems. Enoki are particularly good raw in salads. They may also be used to garnish soups or other hot dishes. If used as part of a cooked dish, they should be added at the last minute, as heat tends to make them tough. These tiny mushrooms provide a good source of vitamin D, as well as small amounts of the B-complex vitamins. 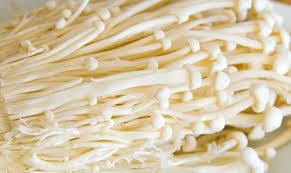 The enoki is also called snow puff mushroom, golden mushroom and velvet stem.